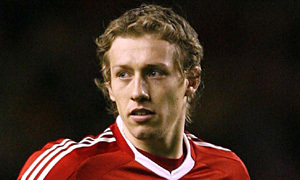 Lucas Leiva has said he thinks that Liverpool can win the Premier League title within the next five years as well as the Champions League now that they’ve appointed Brendan Rodgers manager and signed new contracts with key players. Liverpool has failed to qualify for the UEFA Champions League for the past three years after performing poorly in their league campaigns. However, they have now appointed Rodgers in order to rebuild the club and players such as Luis Suarez, Daniel Agger and Martin Skrtel have all signed new deals. As a result Lucas has told the club’s official website that he hopes in five years to be “winning the league and maybe the Champions League. … The club has already showed many people what we’re capable of doing.” He went on to say that if they keep striving then one day they will succeed. At the moment Liverpool seem a long way from being able to take on leading European teams such as Barcelona, Real Madrid and Manchester United all of which are favourite (with odds of 5/2, 88/25 and 119/10) to win this year’s Champions League. If Liverpool want to even feature on a betting website in the coming year’s they will have to hope that Lucas’ words are true.